1. 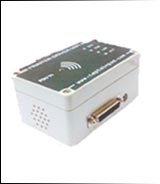 This device adds DOT matrix or Thermal printer in LAN for remote printing. 2. This device acts as temporary storage for KOTs when printer is out of paper or offline. No KOT loss in any condition. 3. It has LED and sound buzzer indication if printer is out of paper or offline. 4. Alternative to this device is EPSON Network Printer (LAN Printer).